BaselWorld 2009 – Turn the clock back for just a moment. Travel with MILUS to the year 1919. It was in the year 1919 at the Route de Reuchenette in Bienne when Paul William Junod, a watchmaker trained and experienced in the art and tradition of his craft, set about realizing his dream. He envisaged creating a solid yet elegant watch, a valuable accessory everyone would be eager to own. Ninety years later, the Milus brand stands for exquisite Swiss watches reflecting the pioneering spirit and ideals of its founder. The TIRION TriRetrograde Seconds Skeleton 1919 limited edition is a tribute to the Milus design tradition and a homage to the passing of time. The name of the Tirion is derived from the constellation of Orion, one of the most easily recognizable and brightest in the heaven. The Tirion TriRetrograde Seconds Skeleton 1919 limited to 38 editions is presented here as an exquisite 18K red gold 6N version, the gold tone used at the beginning of the last century. The exact rhythm of the retrograde seconds function in three sectors of 20 seconds each is given by a Swiss quality mechanical movement in an exclusive special version with automatic winding. Just as unusual and rare as the TriRetrograde function is the unique dial, which is placed in the round, nine-part impressive case of 45mm diameter. It is built up of two layers: the first one is the movement base with a sun-stamped decoration. The second level consists of an off-white dial plate with blued Arabic numerals. Positioned at 6 o’clock, the large date is displayed to its full advantage. The composition of the three seconds display sectors is of eye-catching design: skeleton hours and minute hands constantly allow a view of the three blued seconds hands that jump back in 20-second rhythm. Starting at 6 o’clock, the first hand jumps instantly back to the right to its starting position after 20 seconds. Going clockwise, the next seconds hand at 10 o’clock followed by the third at 2 o’clock take over the same task. This alternation tirelessly repeats itself, giving the overall impression of a magic dance performed by the seconds hands. Connoisseurs of consummate craftsmanship will be fascinated. This timepiece shows off its talents at the back of the case also. 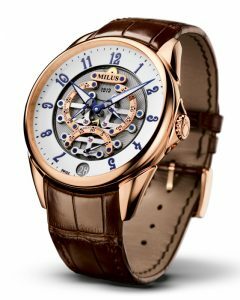 The round convex sapphire crystal window in the screwed-down case back gives a view of the movement and the skeleton oscillating rotor in the form of the Milus logo with the brand symbol at its centre. A comfortable alligator-leather strap rounds off the elegant appearance of the watch. Milus pays a beautiful homage to the Swiss watchmaker’s art by creating the masterpiece TIRION TriRetrograde Seconds Skeleton 1919 Limited Edition and shows once again its respect for the value of time. Swiss quality mechanical movement in an exclusive special version module MILUS 3838 – automatic with retrograde seconds in 3 sectors of 20 seconds each. Movement plate with sun-stamped decoration. Large date display at 6 o’clock. Skeleton oscillating rotor in the form of the Milus logo with the brand symbol at its centre. In 18K red gold 6N, 45 mm diameter. 9-part case, satinised case back screwed down with 6 screws. Screwed strap attachment elements mounted onto case. Round, convex, sapphire crystal viewing window. Hours, minutes, 3 sectors each of 20 seconds at 6, 10 and 2 o’clock. To 30 m (100 feet). the movement base is sun-stamped; the second level consists of a dial plate. Retrograde seconds display engraved on three bridges. Large date at 6 o’clock coated with white SuperLuminova. Faceted, blued skeleton hours, minutes and 3 seconds hands partially coated with white SuperLuminova. Buckle or folding clasp in 18K gold.